In Texas, there is a department store called Ross. It is most similar to Marshalls, which is in more locations. 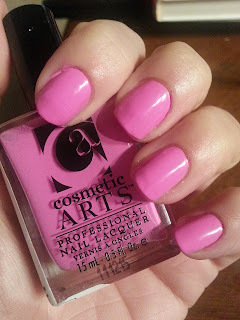 This polish is by Cosmetic Arts and it was $1.99! I couldn't pass up such a bubblegummy, barbie car, cotton candy color! It sang out to me from the shelf like a prize at a carnival game booth - "take me home, Lacey"!! 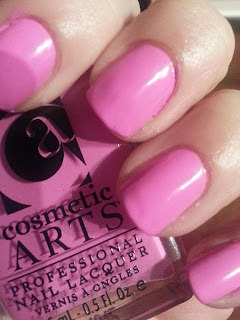 For the price, it was worth it to try a brand I hadn't heard of in order to check out this cheerful color. The only problem is that it is nameless!! Something this sweet deserves a name dripping in unicorns and rainbows and all that sh*t, LOL. What would you name this polish??? Comment or post on Facebook! This is two coats of RainbowHappyBubbleGumUnicornsRainbowBarbieCar Pink and a layer of topcoat. The formula is pretty much flawless, with a quick dry time and incredibly shiny, considering how neon it really is. Next time I go to Ross, I will be keeping an eye out for more Cosmetic Arts polishes! butterLondon Trout Pout & Rainbow Honey! butterLONDON Rosie Lee Vacation Nails! 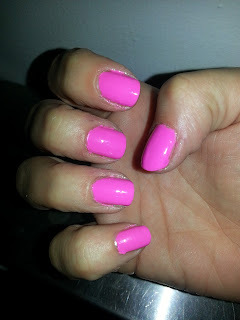 Nars Ratin Jot Meets Naild'It Boomberry Blast! 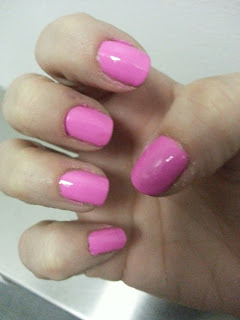 Mao-Nicure Monday & Max Factor Fantasy Fire! !